This article first appeared in The New York Times, 7/11/06. WINSTON-SALEM, N.C. - Inside the Wake Forest Institute for Regenerative Medicine's spacious new headquarters here, when asked how many siblings he has, Anthony Atala gives a long gentle laugh instead of a reply. Tailor-made: Anthony Atala in his laboratory at Wake Forest, where he makes bladders, urethras, heart patches and blood vessels. Just to have shared that he was born in Peru and comes from a large family is more than he normally divulges about his personal life to journalists. But asked about his work with urothelial cells - the cells that line the bladder, ureter and urethra - Dr. Atala bends forward and talks a blue streak. Which might be expected of a urologist and tissue engineer who grows, from scratch, fully functioning bladders. In April, when the two-year-old institute that Dr. Atala directs for Wake Forest's School of Medicine moved into some 50,000 square feet of space in the Piedmont Triad Research Park, it became one of the world's largest research facilities dedicated to regenerative medicine, a practice that aims to refurbish diseased or damaged tissue using the body's own healthy cells. At the institute, he and more than 80 colleagues are working on tissue replacement projects for practically every body part - blood vessels and nerves, muscles, cartilage and bones, esophagus and trachea, pancreas, kidneys, liver, heart and even uterus. In the long term, the scientists hope, patients may no longer have to wait on the national transplant list "for someone to die so they can live," as Dr. Atala puts it. Organs could be tailor-made for people. "The reason this technology works: It's not really surgery," Dr. Atala said. "We're just priming the pump" by putting the appropriate cells into the appropriate place and asking the body to do the rest. This was because adult stem cells - although known to exist in skin, intestines and other tissues - remained elusive, as did the slightly more mature progenitor cells, which also generate the specialized cells that make organs function. Cell biologists, Dr. Atala recalled, were missing the boat. "The irony of the whole field was that people were looking for cells according to the properties of the tissues they resided in," he said, "but they were overlooking the tissue's regenerative cells, the cells that grew best, because they were immature and didn't yet have those properties." When Dr. Atala arrived on the scene in the late 1980's, he was, he says, "the reluctant researcher." But the program's director, Dr. Alan Retik, thought he was better suited for a new two-year version of the program, which included a year of research. "Alan called me in Louisville to say they had picked two candidates, and that I was one of them," Dr. Atala recalled. But, he said, "I really only wanted to be a surgeon." He declined the offer. "My wife finally convinced me that if we were going to Boston, we might as well stay for two years," Dr. Atala said, with his light chortle. Obtaining cells, or chondrocytes, from a patient's ear cartilage and injecting them into the ureter's weak juncture, he was able to form a small cellular ridge that stopped the urine's reflux. "This is the type of innovative person he is," said Dr. Retik, the chief of urology at Children's Hospital Boston. "No one else was interested in trying to use urothelial tissue, and people thought that this attempt wouldn't amount to much." But it did, effectively damming urine reflux. Today, a number of different remedies are available. Meanwhile, as a surgeon in training, Dr. Atala was troubled by an operation he was performing on young patients at Children's Hospital. When a bladder was removed, whether because of cancer or another disorder, the standard procedure since the 1800's was to cut out a section of bowel and implant it as a substitute bladder. "Doing bowel-for-bladder replacements in children really got to me," Dr. Atala said. "It's one thing to put them into an adult, but putting them in a child with a 70-plus life expectancy didn't make sense when you knew there would be trouble down the line." 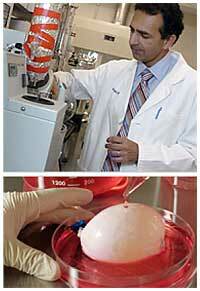 He began wondering, Would it be possible to grow a new bladder from healthy urothelial cells? "It was a naïve question," he said. But no longer, as a study published in April in the medical journal Lancet made obvious. In it, Dr. Atala and Dr. Retik reported that they had achieved good results for up to six years in seven young people with bladders grown in the laboratory from the patients' own cells. The researchers plan to perform the procedure with other patients soon. "What do you mean you can't get them growing?" the scientist asked. "I grow them all the time, and, like you, they last for a few weeks and then die. The cells have a natural senescence." Dr. Atala, who served on the medical school faculty at Harvard from 1992 until his move to Wake Forest in 2004, did not give up. He zeroed in on the bladder's basement layer of cells, just as one of biology's foremost cultivators of cells, Dr. Howard Green, had done in the 1970's with skin. Then, after nearly four years of trying, Dr. Atala had urothelial cells proliferating in a dish. From a square of tissue less than half an inch wide, he could, if he wanted, produce enough tissue to cover a football field. By 1996, he had fashioned bladder-shaped molds and, in accordance with a bladder's composition, seeded the inside with urothelial cells and the outside with muscle cells, which were easy to grow. Working from the knowledge he had gained from bladder tissue, Dr. Atala continued to improve on a basic strategy: grow a tissue's "committed" progenitor cells, attach the cells to a scaffold made of degradable polymers or natural substances, like collagen or keratin, and implant the structure. He first applied this strategy to the urinary and genital tracts, the territory he knows best. "Then, once we finally got it, we thought, boy, let's try some other tissue," Dr. Atala recalled. "The only changes each time are the type of cell and the biodegradable scaffolds," he said. "Once we transplant tissue, it will suffocate if it doesn't have access to a blood supply and oxygen," said Dr. Shay Soker, associate professor of surgery at Wake Forest, who is studying how growth factors added to scaffolds can promote vessel growth. Getting nerves to grow in the implant is also a hurdle. Dr. Atala leaves the job of getting the bladder replacements to the clinic to Tengion, a company established in 2003 that was his institute's first corporate partner. Tengion says it hopes to receive Food and Drug Administration approval by the end of the year for a clinical trial. Using a patient's own tissue in this fashion for self-repair is "inevitable," said Dr. Retik, who is a scientific adviser for the company. "It has so many advantages over conventional surgical methods that ultimately it will be the preferred method." Voltaire once mused that humans were certain to find a way of regenerating their heads - a coup that would benefit some people a great deal, he added. While tissue engineers aren't likely to regenerate complex parts on a regular basis any time soon - least of all the human head - Dr. Atala, who is also director of the National Regenerative Medicine Foundation, recently received $1 million from the Department of Defense for research that will be undertaken by a coalition of research centers. A primary goal is to grow limbs for injured soldiers. "A salamander can grow back its leg," Dr. Atala said. "Why can't a human do the same?"